Here is a copy of Karen's most recent article which appeared in the January 2010 issue of Toastmaster, Toastmaster International's magazine. Reprinted with permission. Click here to hear Karen discuss this article in a Podcast. I’ve been speaking on the topic of family caregiving and giving this particular speech, or some variation of it, several times a month for about five years. Why, then, did I – an experienced speaker – recently suffer from an attack of stomach-turning stage fright? For some reason, on this particular day, my heart started pounding and those little butterflies I sometimes feel seized the opportunity to grow to the size of bats! I hadn’t even left home for the event, but I was already in deep trouble. I’m passionate about my topic and believe in my message and my presentation. I’m always excited to share my story and help the caregivers who come to hear me speak. I knew the venue was a prestigious country club in Palm Desert, California, with excellent audio and visual equipment. The luncheon tables were going to be set with linens and lovely bouquets of spring flowers. The attendance exceeded everyone’s expectations. This was a perfect setting for my presentation. So I stood there, fighting the bats and wondering: What’s going on? About a dozen friends who had never heard me speak professionally were attending this event. I was having the speech video and audio recorded. I was hired to do this presentation by an event planner who is also a friend. She had never heard me speak, and I wanted to do an exceptionally good job for her. Having friends in the audience is a good thing! Familiar faces are always welcome, and I knew the subject matter was appropriate for most of them. The recording shouldn’t be of any concern. It was being done by a professional whose job was to make me look good and provide me with additional back-of-the-room products to sell. I could let him be nervous about that. Why did I need to be concerned about doing an exceptionally good job for the event planner? I strive to do an exceptionally good job every time I speak, and this was no different. I was well-prepared and well-rehearsed. I was dressed appropriately and immaculately groomed. This list helped me realize that I simply needed to put a few of my advanced-speaker tricks into play to take control of the unexpected anxiety. This particular event was set to take place about 30 minutes from my home. As soon as I started my car, I tuned into a country music station and sang along with the various artists – as loudly as I could. By the time I arrived at the venue, I was about 75 percent back to normal and beginning to look forward to speaking. No caffeine on speech days. I had ordered decaffeinated coffee that morning, but did I actually get it? (Mental note to skip coffee in future). Avoid dairy products. They can coat your mouth and throat. Check. No alcohol. It can affect your speech and thinking. Check. Throat lozenges. They can soothe an irritated or dry throat. Check. Breathe deeply. It reduces body tension and slows your heart rate. Check. Stretch. It helps to physically shake tension out of the body. Check. Greet each audience member at the door. Seeing their smiles helps humanize them for me and shrink those bats back down to butterflies. Key. The last bullet point was the key. I always try to talk with attendees prior to my presentation. This way, I become more connected to each of them as a part of the audience, and I believe it solidifies the audience’s connection to me as well. Although it does take additional time to do so, I feed off that interaction with the audience because it generates even more energy for me as I begin my speech. On this day, I positioned myself at the far end of the sign-in table so as not to impede the check-in process. When each person picked up his or her program and name badge, I introduced myself as the keynote speaker. Everyone seemed touched by this gesture. Most people said something like, “I’m so happy to meet you. You’re the reason I’m here today.” It became clear that many people I met really needed to hear what I had to say. What better cure for the jitters is there? 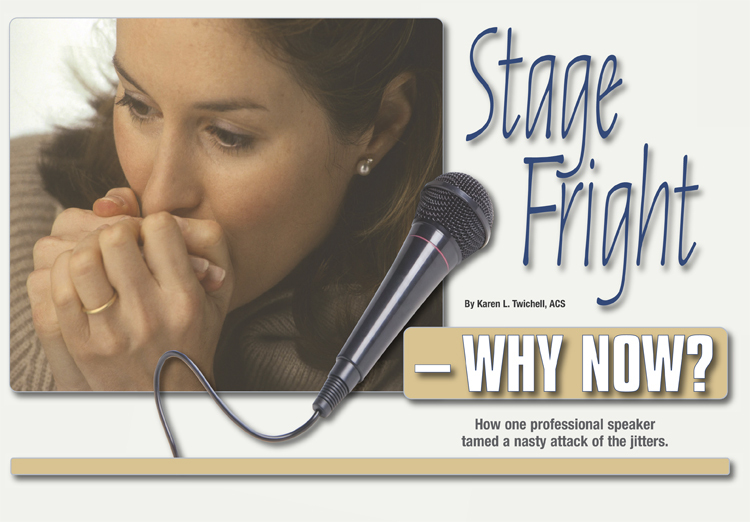 “No matter how experienced we become as speakers, the potential for some level of stage fright never really goes away." So I pursued those conversations a little further. I asked if they were currently in a caregiving situation, or if they expected to be soon. It didn’t take much to get them to respond. The trick was to learn a little about what they needed from me without hearing each person’s entire story. That way, I could move on to the next attendee and gather as much information and encouragement as I needed. I assured each person that if they didn’t get exactly what they needed from my presentation, I would be available after the event to help in any way possible. By the time I stepped up to the podium, I knew how many audience members were caring for loved ones. I knew the majority were caring for parents, spouses or siblings. And I knew they were dealing with illness or aging, as opposed to something short-term and less disheartening, such as an injury or a newborn child. Because I knew this, I could speak to each audience ` member as if he or she were the only one in the room. I memorized the names of a few attendees who were particularly open about their caregiving challenges during our discussion and used them throughout the presentation. This technique told the audience I really listened to them earlier and that I really wanted to help. I have found that using names keeps people alert and gets them more involved in the presentation. I also mentioned the names of a few others sitting near the front because I could read their badges. For example, I said, “Suppose Carol here was having trouble convincing her mother that she should no longer drive a car.” It didn’t matter if Carol was actually caring for her mother, because I knew that many of the attendees were dealing with aging-parent issues. As a continuing member of Toastmasters International, as well as a professional speaker, I was clearly reminded on this day that I was not immune to suffering a nasty bout of stage fright. I hope to be prepared, always, for that day when the butterfly-bats and the rapid heart rate gang up on me again. A lot of good ideas from experienced Toastmasters are shared in meetings about how to handle this situation. Knowing some of them helped me beyond my greatest expectations to make those butterflies flutter lightly once again. Karen Twichell, ACS, is an author and professional speaker who is a member of Rancho Speech Masters club in Rancho Santa Margarita, California. Reach her at www.caregiversjourney.com.